Looking for an easy cheese fondue recipe? This is a classic recipe for an easy cheese and wine fondue using either Swiss or Gruyere cheese and white wine. 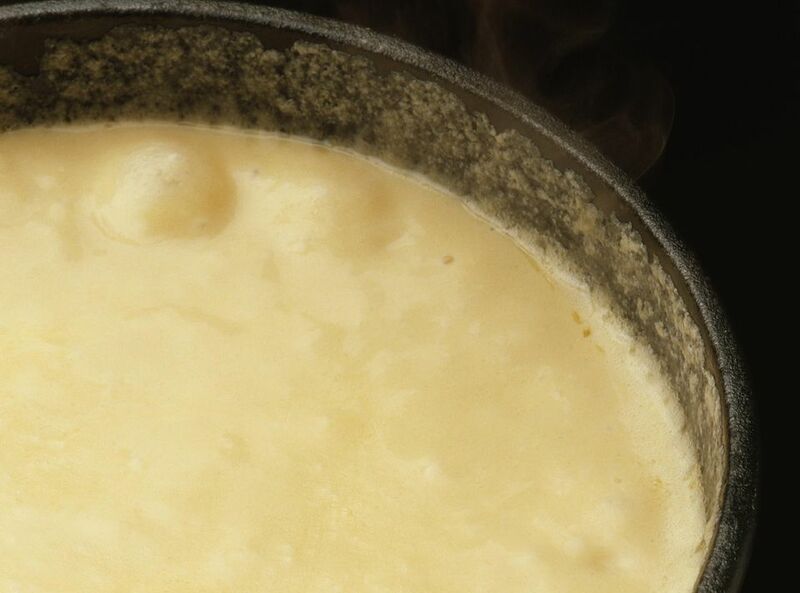 Gruyere is the traditional penultimate fondue cheese, but any kind of cheese which melts (that is, not fresh soft cheese and not hard cheese such as Romano or Parmesan), even plain old cheddar or Monterey Jack will give you a delicious fondue, even if it's not the traditional way. As for wines, anything that's not too sweet will do the trick. A pinot grigio or sauvignon blanc should be easy to find, or you can also pick up a Chablis or a Muscadet. Personally, I'm not a fan of drinking sauvignon blanc, so I tend not to cook with it either, and some people say that it's strong fragrance doesn't belong in a fondue. But, I'm also of the belief that it's also kind of hard to go wrong when you're eating melted cheese. You'll find that this easy fondue is simpler and with fewer ingredients than other fancier recipes, yet tastes just as great! Cheese, wine and a bit of flour and garlic are really all you need! If you need to make this recipe gluten-free, using a gluten-free flour will work just fine. Heat the white wine in a saucepan over medium heat. Slowly add remaining ingredients, stirring to melt the cheese. When cheese is melted and all ingredients are combined, transfer to a fondue pot if you have one. If you don't have a fondue pot, a crockpot set on low can keep your fondue warm, or, use a cast iron skillet which will stay hot, and warn your guests not to touch the hot pan.